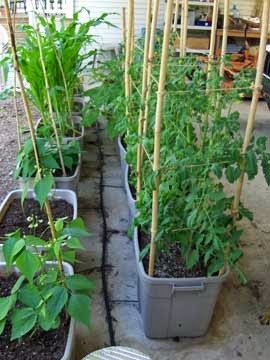 I love patio gardens... You don't have to go very far to eat. 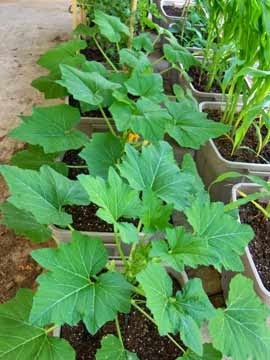 The self-watering containers under roof (for shade) are doing much better than the greenhouse containers. The very early heat did a number on the greenhouse plants. 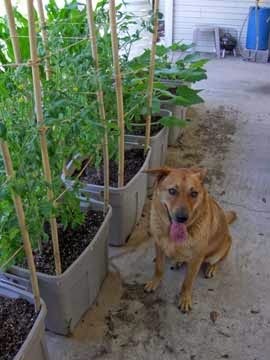 Although we are harvesting some nice banana peppers, green peppers, and cherry tomatoes, the regular tomatoes are rupturing (no, make that exploding) from the heat. These pics were taken in May. It's now the end of June. 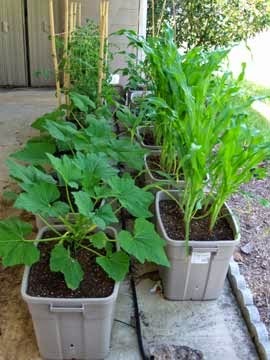 We've decided the corn should be on a separate line than tomatoes, corn and squash because of it's extra nitrogen needs. Duh! These plants get the morning sun up until 12:00 or so, then the hot (I should say un-godly hot) afternoon sun is shaded by the roof. There seems to be enough reflected light from then on to provide adequate photosynthesis. Our fertilizers: Pure Black Castings™ mixed into the potting soil; VermaPlex® added to the water reservoir. For extra nitrogen, we added a cloth bag of VermaMax® to the water reservoir and let it leach into the water. The corn benefits from this added nitrogen, although the beans don't need it. That's why we've decided to put corn onto a separate system. Live and learn. VermaMax®: New certified organic source for extra nitrogen and calcium. Organic chicken litter composted with VermaPlex®. Combo Specials: Saves on shipping.